In August of 2000 my then-employer, a huge multinational computer corporation, sent me to London, England to train a British team on the multimedia development process we had worked up in Atlanta. Let me tell you -- travelling to a cool European city on expense account is a truly wonderful experience that every human should have. Really. Anyway, while i was there i took the opportunity to read as many of those wonderful weekly British music mags that cost way too much when imported to the US. In NME and Melody Maker (R.I.P.) and the sunday London Times i read very positive reviews of an album called Dance The Devil by an Irish group called The Frames. Three good reviews describing finely crafted light pop -- that's a recommendation if i ever heard one. And i was able to locate a used copy of the disc for a mere £5 in some shop near Soho one sunny Saturday afternoon while out wandering the city. I took the disc back to my hotel room for a quick listen before meeting up with co-workers for dinner, and was blown away. That is one fine album, and in the two years since then i have forced every other Minion (except Silvergeek - yet!) as well as many other random individuals to listen to Dance The Devil. A few months ago general Minion-y buzz began to flow about the impending New Pornographers show on Valentine's Day. I wasn't too excited (Beach Boys influenced pop leaves me yawning, for the most part), but the show was at least something for a perpetually dateless music hermit like myself to do on VDay. Then The Echo posted on their website that The Frames (from Ireland) were opening. "Holy frijoles," i thought. "The Frames must have a new album to go with their tour!" So i hopped into the PostLibyan-mobile and sped down to Criminal Records. And lo, there, on the shelf, sandwiched between Fugazi and Dance The Devil itself was a Frames disc i did not have. And verily, did i purchase the disc, all the while discussing the merits of said band with the clerk (who played in Chinaski a while back, and who is also a rabid Frames fan). And i went home, plopped it into the CD player, and sat. 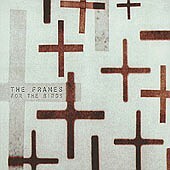 The Frames have topped themselves, releasing a fine album of soulful pop music that simply amazes me. It is on par with the finely crafted Dance The Devil, and yet still different. The liner notes for For The Birds indicate that this album was made without pressure on the band from a label. (Overcoat is, according to their discography on AllMusic, their fourth album and their fourth label!) They took their time and made something that they are happy with. The joy of making music really shows on this disc. The final product, For The Birds, uses material from all three sessions. The combination of the lo-fi demo session with the smoothly produced studio sessions is used to wonderful effect, especially on Disappointed. Vocalist Glen Hansard's voice (at least, i think it's his -- far be it for The Frames to make it easy on a poor critic and list, in the liner notes, who does what, musically speaking) is lo-fi: grainy, gritty, mono, and barely there. The rest of the music came out of a studio: fresh, clear, and crisp. It's a wonderful effect that you need to hear to believe. But it's not overused, and that's good. Lo-fi gets to me after a while, and The Frames display a sense of moderation in using it on the album. In general this is an album of delicate guitar melodies and subtle yet passionate vocals. The songs are calm and seem almost folky at times. One notable exception is Early Bird, which rocks loudly and serves as a nice break after a few songs of slow moving pop. But it was the two song sweep of What Happens When The Heart Just Stops into Headlong that bowled me over the first time i heard the album and that continues to impress many many listens in. What Happens When The Heart Just Stops begins with whispered vocals and a sparse mess of key blips, subtle glitchy hits, and strummed guitar. It swells slowly and forcefully, eventually exploding with horns and loud singing. The explosion hits with amazing expressive passion... The song then fades lightly into Headlong. Hansard puts forth his strongest melody, and is backed up by brushed drums, light guitars, and subtle strings. It's a wonderful tune that fades into the rave country of Fighting On The Stairs. Those two songs are an impressive display of emotional power in song. And that's why i like The Frames -- they are expressive without being cheesey. Alive without being overly romantic. Emotional, yet not sappy. So my recommendation to anyone who likes expressive, light pop music is to run, don't walk, to your nearest independent record store and buy this disc. Now.